"I remember Shirley with her twin sister Betty and brother Bill ,from my early ch"
Shirley Fulton ~ Suddenly, at Palmerston and District Hospital on Tuesday, October 30, 2018, Shirley Margaret Fulton of Harriston, in her 86th year. 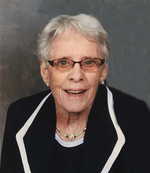 Loved and remembered by her twin sister Betty Fulton of Harriston, brother Bill Fulton and his wife Mary-Belle of Oakville, sister-in-law Edna Fulton of Oakville, and by her nieces, nephews, and friends. Predeceased by her parents William and Emma (Hopf) Fulton, and by her brother Archie. Visitation will be held at the Hardy-Lee Funeral Home, Harriston on Thursday from 7:00 until 9:00 p.m. The funeral service will be held at Knox-Calvin Presbyterian Church, Harriston, on Friday, November 2nd at 11:00 a.m. Rev. Kathy Morden officiating. Memorial donations to Knox-Calvin Presbyterian Church, Harriston, or to Palmerston Hospital would be appreciated.